Lock in a great price for La Fonte – rated 9 by recent guests! La Fonte is an amazing homey place to stay. Highly recommend if you're looking for somewhere comfortable and cosy to stay in a lovely town. We visited a restaurant round the corner which exceeded our expectations and watched the soccer with the locals. The staff were very friendly and despite not speaking english, helped us find a bus, plus posted some pants we left behind by accident. Great home away from home! Amelia the host was very accommodating and served me a wonderful breakfast plus directed me to see the famous Gulpiyuri Beach (600m away). I was walking the Camino del Niete pilgrimage. 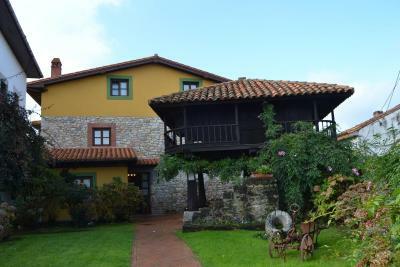 This is a nice property in the cute little town of Naves, an easy walk from the beach of San Antolin. It was not too long of a walk from the Villahormes train station either. The room was very comfortable - I slept really well, which I usually don't when traveling - but my only complaint would be to warn solo travelers who book the single room. My room was NOT what was pictured when I booked. Instead of the lovely room in the pictures, my room was an extremely small room, right off of the reception area so it was a bit loud in the morning. That is fine to have a small room, but for the rate I paid, and the pictures of the room I was reserving, it was not what I expected. But overall, the property was nice and the staff were extremely kind and helpful. Friendly staff and better than average breakfast. Cozy house in the middle of the village. Lovely peaceful setting and very friendly and helpful hostess. Property was superb. Lovely little place. Very cosy and excellent decor and rooms. It s one of the most comfortable and nicest places I ve stayed ! The owners were very kind and welcoming too. La habitación de nombre Miércoles es preciosa. Da al horrio y se ve la Iglesia del pueblo. Todo fue genial, desayuno abundante ( dulce) y Emília muy amable. Prolongue un día más mi estancia y me cambiaron de habitación, Lunes, no tuve suerte, tenía olor de tuberías en el baño q se introducía en el cuarto. Es un sitio precioso, el desayuno muy abundante con cosas dulces. Una terraza con horrio y Emília es muy amable. Habitación pequeña pero cómoda con cama grande, solo pasamos unos noche pero la atención encantadora, el desayuno buenísimo. La Fonte This rating is a reflection of how the property compares to the industry standard when it comes to price, facilities and services available. It's based on a self-evaluation by the property. Use this rating to help choose your stay! Located in this charming rural village by the sea, this boutique hotel has delightful gardens with a traditional granary and fruit trees – enjoy the views of the flowers from the terrace. Walk up to the Fonte entrance through the flower-lined gardens and admire the ancient wooden granary that sits in front of the hotel. Relax with a good book in the communal lounge which has an open fireplace you can curl up next to in the cooler months. All the Fonte rooms are exterior facing and enjoy views over the gardens and surroundings. Enjoy the exclusive feel of the Fonte thanks to its intimate layout of just 7 rooms. 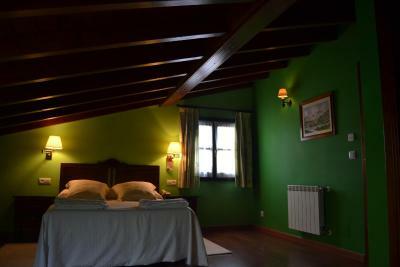 The attic rooms have attractive, sloped ceilings with wooden beams. 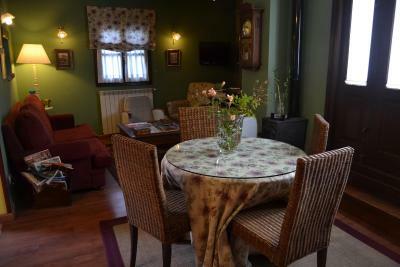 Romantic decoration includes wooden floors, rich-colored walls, antique-style furniture and floral prints. 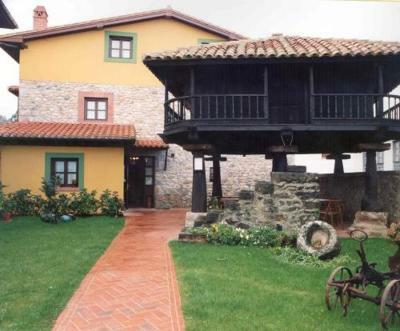 Set in an attractive square called Plaza Santa Ana, the Fonte features a great location in the village which is a famous landmark along the Saint Jacob’s Way pilgrimage. Couples in particular like the location – they rated it 8.8 for a two-person trip. This property is also rated for the best value in Naves! Guests are getting more for their money when compared to other properties in this city. 냨 Great Food: Meals here are highly recommended! When would you like to stay at La Fonte? 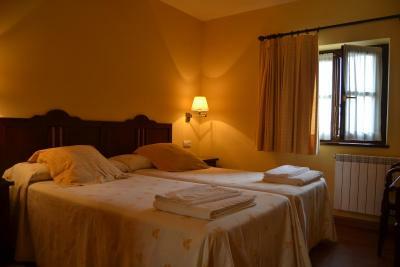 This elegantly decorated room includes 1 double or 2 single beds. It features a TV, telephone and private bathroom. 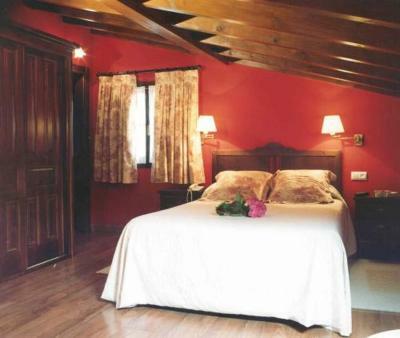 This elegantly decorated room includes 1 single bed. It features a TV, telephone and private bathroom. 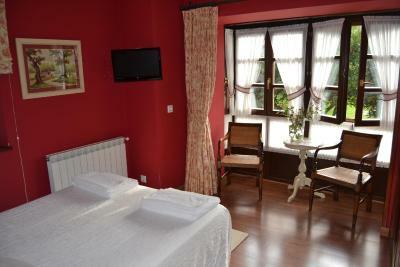 This elegantly decorated room includes 1 double bed and 1 single bed. It features a TV, telephone and private bathroom. Hotel surroundings – Great location - show map Guests loved walking around the neighborhood! House Rules La Fonte takes special requests – add in the next step! All children under 2 years are charged EUR 10 per night in a crib. All children under 16 years are charged EUR 11 per night for extra beds. 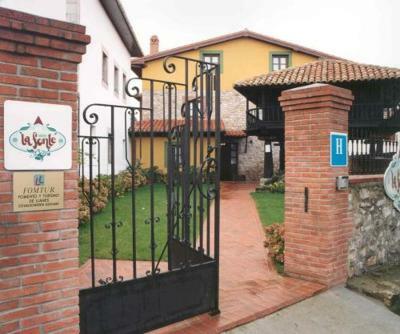 Any additional older children or adults are charged EUR 11 per night for extra beds. La Fonte accepts these cards and reserves the right to temporarily hold an amount prior to arrival. Room was okay but furnishings quite old (curtain rail was coming off, etc) and the bathwater was brown even after running the hot water for 10 mins. For this price I've had better in this part of Spain. Also very restricted check in (2-6pm). There was not anything that I disliked about it! There was wastepipe smelling in room very strong all the time in june 2017.Everything else was ok.